An elderly couple was killed in a crash with a semi truck Wednesday afternoon on Pacific Highway in Milton, according to police. The semi truck was southbound on Pacific Highway and reportedly ran a red light, colliding with the driver's side of the SUV, which was on Porter Way and crossing the intersection. Both victims were in their late 80s and lived on Fox Island. They were driving to visit family when the accident occurred. The driver of the semi was taken to the hospital for evaluation. The incident remains under investigation. 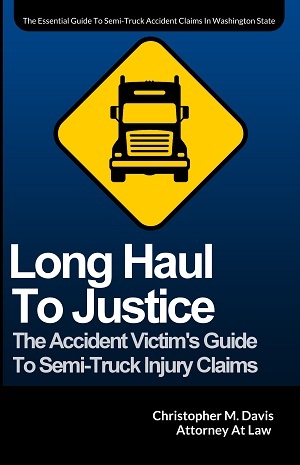 Accidents involving semi trucks, such as the one in the incident above, are often devastating for victims and their families. A semi truck accident attorney will protect your rights and pursue fair compensation while your family concentrates on recuperating from the psychological and financial effects of the accident. You may be unaware of you and your family's rights after a fatal semi crash. Under Washington state law, semi truck accident victims are eligible for various types of civil damages, including medical expenses, lost wages, pain and suffering and permanent disability. Also under state law, immediate family members have the right to file a wrongful death claim if a loved one is killed in a semi truck accident. These cases are complex. Often there are multiple parties at fault. Depending on the circumstances, the truck driver, trucking company, broker and even truck manufacturer can all be held liable for damages. The right semi truck accident lawyer knows how to determine the liability of all parties involved in order to maximize your recovery. Attorney Chris Davis and the legal team at Davis Law Group, P.S., represents victims of semi truck accidents across Washington state. If you or a loved one has been injured or killed in a truck accident caused by someone else’s negligence, our objective is to help you recover maximum compensation. Mr. Davis works on a contingency fee basis — which means if you don’t win your case, we don’t get paid. Contact our office today for a free case evaluation. Call (206) 727-4000, use the chat feature below or fill out the form on this page to get started.